Change your ATTITUDE. Change your BUSINESS. Change your FUTURE. What’s stopping you from making the changes your business needs to thrive? The most dangerous move in business is the failure to make a move at all. The history of business is filled with companies that are no more because their leaders refused to enact change when the writing was on the wall. Fear. Apathy. Lack of personal responsibility. These simple human flaws can turn a good company into a dead company. The writing on the wall has never been clearer than it is now—and marketing phenomenon Jeffrey Hayzlett is on a mission to make you see it, understand it, and heed it. Today’s business environment is so competitive and volatile that you can’t afford to be satisfied with business as usual. You must make changes now to compete in the future. Building on the principles and concepts in his first book The Mirror Test, Hayzlett takes you on a step-by-step journey to: Develop a “takeover mentality” for your business Summon the vision and courage necessary for driving change Sharpen the mental and emotional toughness to make strategic, lasting change Execute the right changes and deal with any disruptions they might cause Sustain and manage your company’s new-found momentum Change is already happening all around you—to products, to organizations, to entire industries. Eventually, it will happen to your company, whether from outside forces or your own initiative. You’ve always had the ability to institute positive change in your company. Now, with Running the Gauntlet, you have the inspiration and knowledge to make it happen and take control of it—instead of letting it control you. 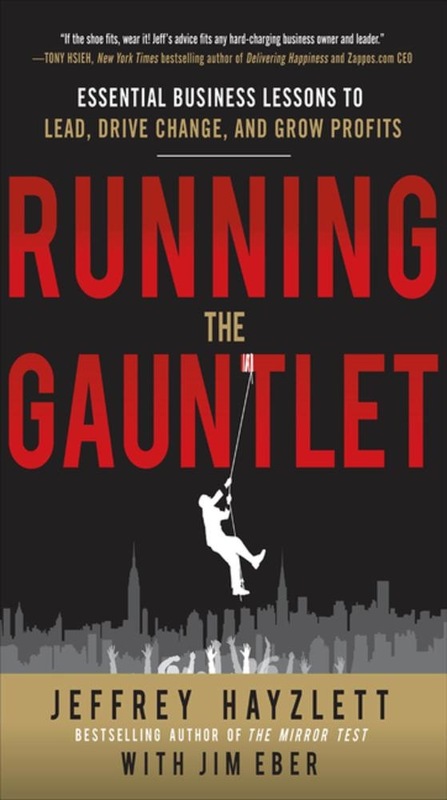 Praise for Running the Gauntlet "If the shoe fits, wear it! Jeff's advice fits any hard-charging business owner and leader." —Tony Hsieh, New York Times bestselling author of Delivering Happiness and CEO, Zappos.com “I've seen a lot of sharks, and Hayzlett's advice comes like a Hammerhead. Acquista Running the Gauntlet: Essential Business Lessons to Lead, Drive Change, and Grow Profits in Epub: dopo aver letto l’ebook Running the Gauntlet: Essential Business Lessons to Lead, Drive Change, and Grow Profits di Jim Eber, Jeffrey W. Hayzlett ti invitiamo a lasciarci una Recensione qui sotto: sarà utile agli utenti che non abbiano ancora letto questo libro e che vogliano avere delle opinioni altrui. L’opinione su di un libro è molto soggettiva e per questo leggere eventuali recensioni negative non ci dovrà frenare dall’acquisto, anzi dovrà spingerci ad acquistare il libro in fretta per poter dire la nostra ed eventualmente smentire quanto commentato da altri, contribuendo ad arricchire più possibile i commenti e dare sempre più spunti di confronto al pubblico online.